Have you ever tasted "Buckwheat Tea" before? It is roasted Buckwheat Grain which is cracked open into smaller pieces. In Japan, you can pour hot water over this and make some tea. It is called "soba-cha" in Japanese, but there is no tea leaf in it, it is just Buckwheat Grain itself. Also, we can use this grain to make various dishes, from appetizers to desserts. Oh, and I recently found out this nutritious grain is called "kasha" (Russian). Currently, I had the chance to experiment with Buckwheat Grain. I was introduced to this product by a friend who I worked with in the past. He currently works as a distributer / salesman working with various Japanese food ingredients and other restaurant items. I approached him one day explaining that I was interested in working as a Recipe Developer, working with both Japanese and Western ingredients. I am trying to create a healthy and nutritious menu which can be made daily. He thought it was a great idea and suggested that I try and create a few dishes using the Buchwheat Grain. 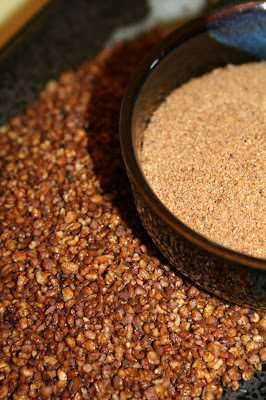 In the next few posts, I am going to introduce a few of my creations using this flavorful and nutritious grain, see ya!